Car rides just became so much cooler now with GPX's portable CD player. Compatible with your CD-Rs and CD-RWs, it's ready to give your ears a workout. Three play modes add a little variety to your listening and the 45-second skip protection keeps your music smooth even when the road gets bumpy. I bought this Unit over 11 years ago and it still works great! Use it laying flat, vertical, or upside down... it still plays great! The Batteries last a long time before needing to be recharged. I carry it in a "pouch" with strap around my neck... walking, running, or bumping it doesn't cause any skipping. This is a VERY well built product! The Price is very reasonable - $20.00! 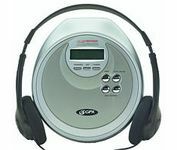 It also comes with a Line Out Jack, Stereo Headphones, battery power indicator, and other features. It also has a port for a external power source. If you like your CDs... this is a Great Product!